A UNSW researcher is involved in two research breakthroughs which exploit quantum behaviour for computing and other applications. Andrew Dzurak of the University of New South Wales worked with Jason Petta from Princeton University, David Awschalom of the University of Chicago, Lee Basset of the University of California-Santa Barbara, and Evelyn Hu of Harvard University. Their review paper was published in the journal Science. 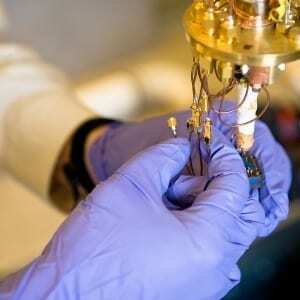 The first breakthrough is the ability to control qubits at room temperature. Previously, temperatures near zero Kelvin were required for the manipulation of quantum bits. The breakthrough is courtesy of new diamond-based materials which allow spin qubits to be operated on at room temperature. In 2010, Dzurak’s team achieved the ability to control the qubits for several seconds before they lapse into classical behaviour. Extremely pure forms of silicon have been developed, which enable researchers to control spin. Researchers have demonstrated the control of spin in billions of electrons for several seconds by using highly pure silicon-28.